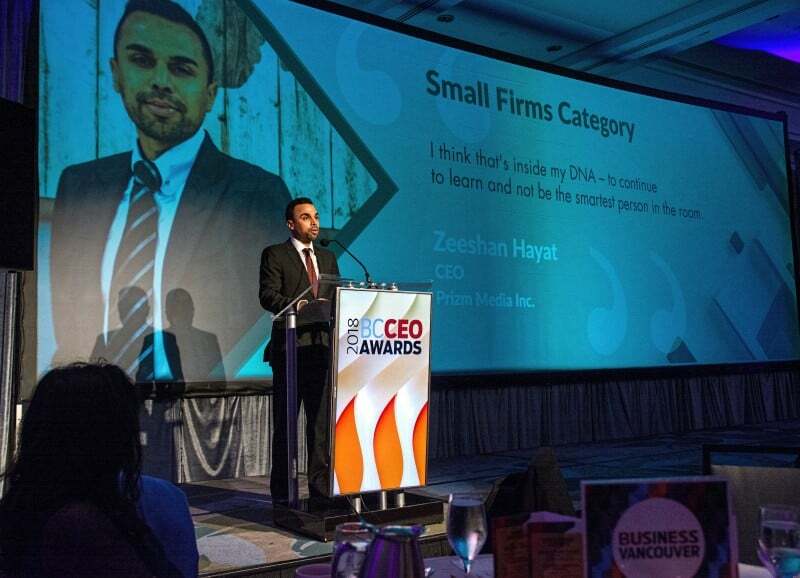 Prizm Media Inc.’s CEO, Zeeshan Hayat wins 2018 BC CEO Award - Prizm Media Inc.
Vancouver BC – November 22, 2018 – CEO of the healthcare technology company Prizm Media Inc., Zeeshan Hayat, was recognized by Business in Vancouver magazine with a 2018 BC CEO Award on November 15, 2018. Though this is the second award for Zeeshan from the publication – he was previously named one of BC’s Top 40 Under Forty in 2014 – he is the first Pakistani-Canadian to be awarded the honour. At the event, Zeeshan paid homage to his grandfather Aslam Hayat, for his support and advice. “My grandfather left his home, his career, his entire life behind in Pakistan so I could have the support of family and a better future. He bought me my first computer which sparked my interest in technology and entrepreneurship. But most of all his kind and selfless actions created the passion I have to do the same for others,” says Hayat. “Zeeshan is not only a great strategist, who thrives in challenging situations, but he is driven by a philosophy of creating a positive impact not only in business, but in the community at large,” says Nikhil Mathew, COO of Prizm Media Inc. Mathew noted that Hayat’s unwavering focus and purpose driven approach is what has led the company to create a high achieving and family culture that feels like home. In 2017, Prizm Media overcame a significant downturn by innovating. The team worked together to focus on its patient care technology that helps pharmacies simplify the patient onboarding experience, reducing costs through automation, while helping their businesses scale quickly and compete. For more information on Prizm Media Inc., read the company’s website. More information on the 2018 BC CEO Award is available on Business in Vancouver’s website . Social Media & PR Specialist @Prizm Media Inc.